I like permanent markers, and Sharpies are some of the best. But there are many situations where the tip of a fine Sharpie is simply much to broad. 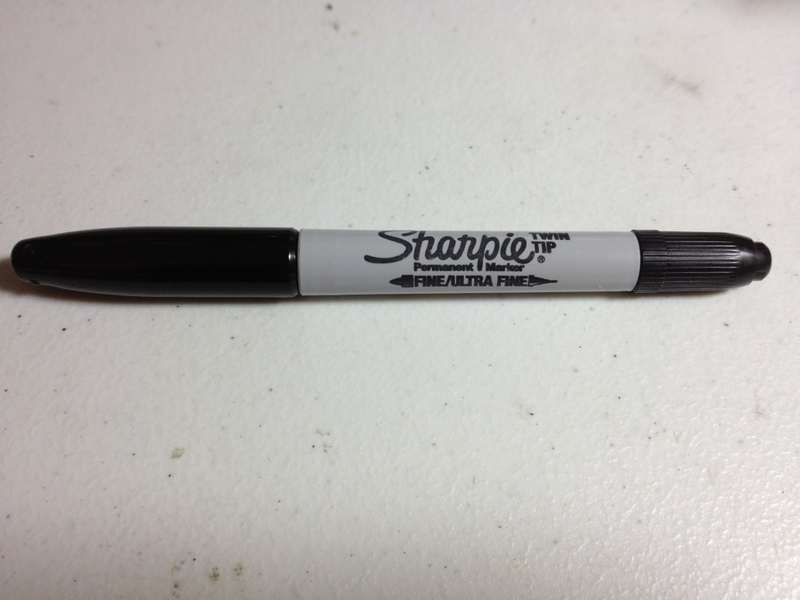 Carrying around a second sharpie in extra-fine seems like a hassle, or vise-versa depending on which size one uses more. The people at Sharpie (Sanford (Rubbermaid)) must have figured this out at some point and so they now have multiple point Sharpies. Let’s take a look at the Fine/Ultra Fine version. The body of the pen is quite like a regular fine-point Sharpie. The cap is slick with a flimsily little plastic clip built in. The body is made out of a similar material and has the necessary information printed on it. 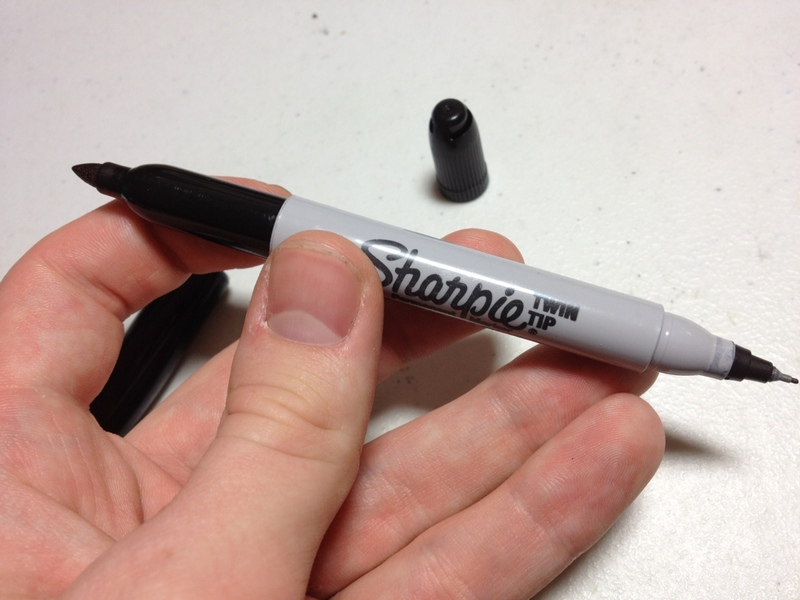 Where there would usually be a rounded-off end on a normal Sharpie, there is instead a tiny cap that has a set of spines, and is much easier to grip than the other end. Pulling either cap off reveals a slick section that is nearly identical to regular Sharpie Fines and Ultra Fines. These sections are not quite slippery enough to have the pen fall out of one’s hands during normal usage. The larger cap posts very easily on the smaller one, but in a very well-thought-out design choice, the larger cap has several small studs that allow the smaller cap to in effect be posted. This doesn’t hold the cap in the most secure manner possible, but is better than the alternative of nothing. The tips are fairly standard. The Fine is slightly larger than a Micron 08 or about 1mm, the Ultra Fine is about 1/2 mm or about the size of a Micron 05. Both of these are large for standard writing, but for writing on boxes, other large spaces, or some drawing they are superb. The ink is standard Sharpie fare: a cold, deep black (when the marker runs dry it becomes a much warmer color) that covers well, but not the best. It is permanent and run-resistant, it stains clothes and is unpleasant on the skin. It is non-toxic for normal use, but heavily sniffing or eating would be cause for concern. Just be normal with your normal usage. Is it worth it to get a pen with two tips? Yes, if you find a need for both. I’d suggest going with the fine more often, as the ultra fine tends to dry up faster with its smaller cap. But there is still a good amount of utility there. The thing is easy to use, and works really well. Moving, signing, warehousing, and large art pieces are where these will find their homes. And really, for a nice black permanent marker, there are few that match and none that are better. This entry was posted in Intermediate Supplies, Utensils and tagged fine, marker, permanent marker, review, sharpie, tip, twin tip, ultra fine by Dragon Co (Austin Smith). Bookmark the permalink.